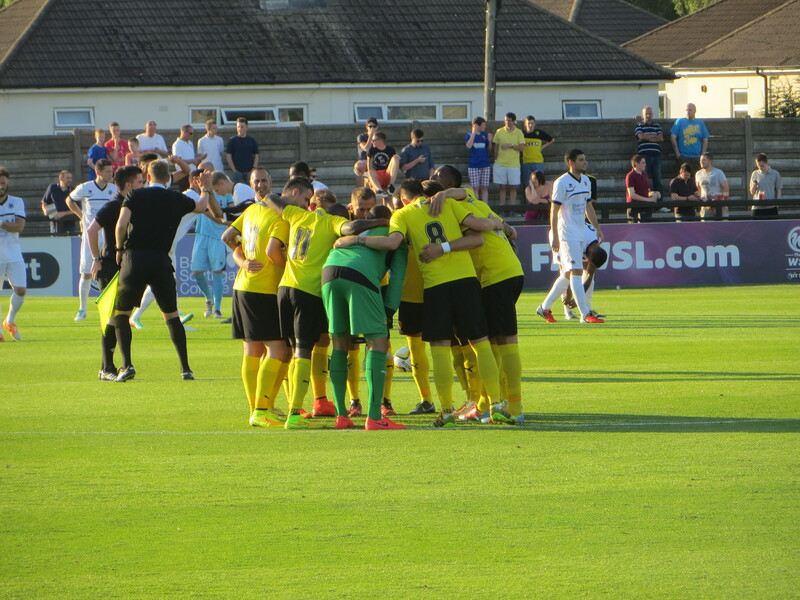 As we gathered at Meadow Park, the news on everyone’s lips was that Deeney was absent from the squad. The conclusion was that we had seen the last of him in a Watford shirt, which is a great shame but, if it does come, nobody can deny that the lad deserves his move. Since our last visit the ground has undergone a transformation, with the covered terrace along one side of the ground replaced with a shiny new stand. Needless to say, I rejected its charms and took up a position on the open terrace behind the goal. The Deeney-less starting line-up was Gomes, Doyley, Angella, Tamas, Pudil, Abdi, Battocchio, Tözsér, Anya, Vydra and Dyer. The first chance fell to Dyer who went on a run down the left and unleashed an angled shot, but Courtnage was equal to it. We were dominating early possession and Anya tried to chip the keeper but Courtnage reached up to catch the ball. For the home side, a cross from Montgomery reached Shakes who shot well wide. Abdi played a lovely ball towards Battocchio, but it was cut out and rolled harmlessly to Courtnage. At the other end, Montgomery tried a shot that flew wide of the near post. We should have taken the lead as Vydra ran on to a lovely ball over the top and left the defence standing, but his shot was wide of the target provoking groans from the Watford fans in the crowd. Anya was the next to threaten with a low shot from the left, but Courtnage was down to save. After half an hour, there was a break in proceedings seemingly to take on water. It seemed a bit over the top as it was a lovely evening (I didn’t need my cardi), but hardly Rio temperatures. The next goal attempt came from the home side, but Nunn’s shot ended up on top of the goal. There were calls for a penalty for the visitors as Dyer went down in the box, but the referee gave the kick the other way. Just before half-time, Montgomery had a great chance to give the home side the lead but his shot flew just over the bar. Then Dyer went on a run through the defence, but Courtnage saved at his feet. The final action of the half was a looping shot from Garrard that was straight into the arms of Gomes. 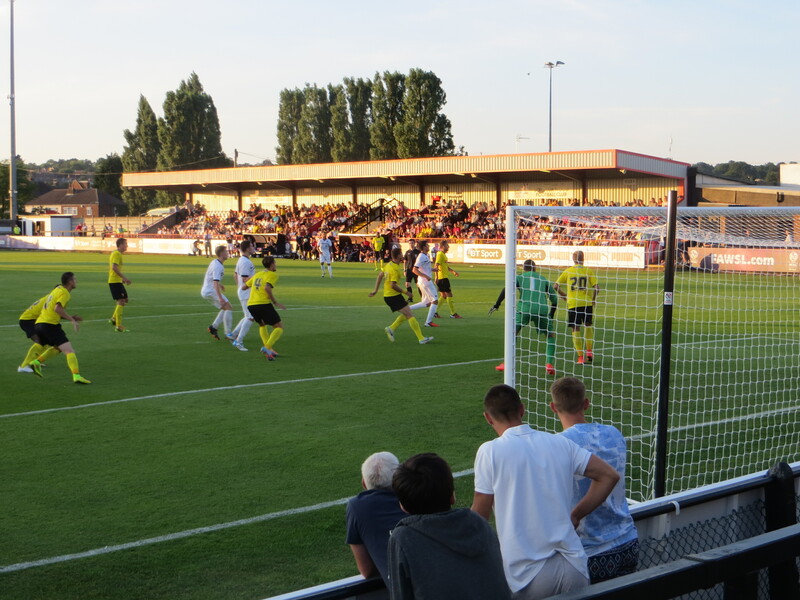 Watford had the lion’s share of possession in the first half, but goal chances had been at a premium and Boreham Wood had threatened on the break. At half-time, there were a number of substitutions as Hoban, Ekstrand, McGugan and Ranegie replaced Doyley, Tamas, Battocchio and Anya. 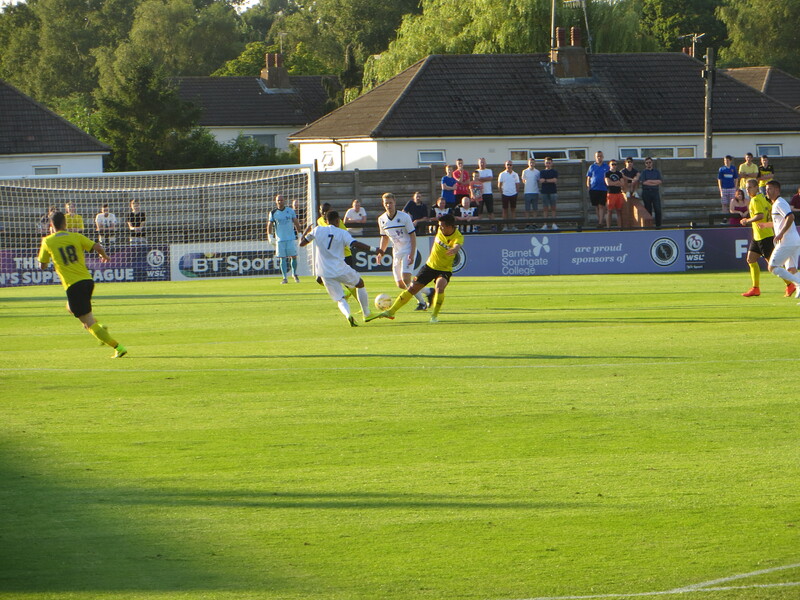 Boreham Wood had the first chance of the second half, but the shot was straight at Gomes. Watford really should have taken the lead as a cross from Vydra reached Ranegie but he headed into the side netting. Then Ranegie and Vydra combined to feed McGugan who scuffed his shot straight at Courtnage. Pudil crossed for Dyer whose first touch was too heavy before he hit a low shot that Courtnage dropped to save. Vydra and Ranegie exchanged passes before finding Abdi in the middle of the box from where he somehow managed to screw his shot well wide of the target. We had another great chance as Vydra met a corner with a back header that Courtnage did well to keep out. From the subsequent corner Angella snuck in, but Reynolds got to it first to clear over the bar. Montgomery latched on to a clearance and hit a shot from distance that required a decent save from Gomes. We finally made the break-through in the 68th minute as Vydra ran across the field and unleashed a bullet that hit one of the Boreham Wood players on the way in and likely caused some bruising. With 15 minutes remaining, Fabbrini replaced Dyer. He was involved in the next goal attempt finding McGugan whose shot was tipped onto the crossbar, the ball rebounded to Abdi who couldn’t get into position for a proper header, which was a waste as Vydra was lurking behind him much better placed for a shot. Then Abdi found McGugan in space, but he wellied his shot over the bar. The final action in time added on was a shot from the former Watford youngster, Whichelow, which we were relieved to see fly wide of the far post. It had been a good work out for the boys and, while we should have scored more, pre-season games are all about building up fitness and the Watford players knew they had been in a game. This entry was posted in Watford FC and tagged Almen Abdi, Ben Nunn, Boreham Wood FC, Cristian Battocchio, Daniel Pudil, Daniel Tozser, Diego Fabbrini, Gabriel Tamas, Gabriele Angella, Graeme Montgomery, Heurelho Gomes, Ikechi Anya, James Courtnage, Joel Ekstrand, Lewis McGugan, Lloyd Doyley, LLoyd Dyer, Luke Garrard, Matej Vydra, Mathias Ranegie, Matty Whichelow, Ricky Shakes, Tommie Hoban, Watford FC on July 27, 2014 by franelynn.